As you’ve read in this blog, in the local media, and heard from your managers, UMass Memorial Health Care is working through some very challenging financial issues. We are dealing with these issues by reducing our expenses, seeking new revenue sources, and most importantly, redesigning the way we care for patients so that we can increase quality and reduce costs. This is all part of our long-term strategy to deliver greater value to our patients and make this the best place for you to give care and our patients to receive care. This image outlines our current strategy. You can click on it to see a larger version. As you can see from the slide, we are setting our goals and expectations high, and we will be depending heavily on our 13,000 innovators to help us get there. 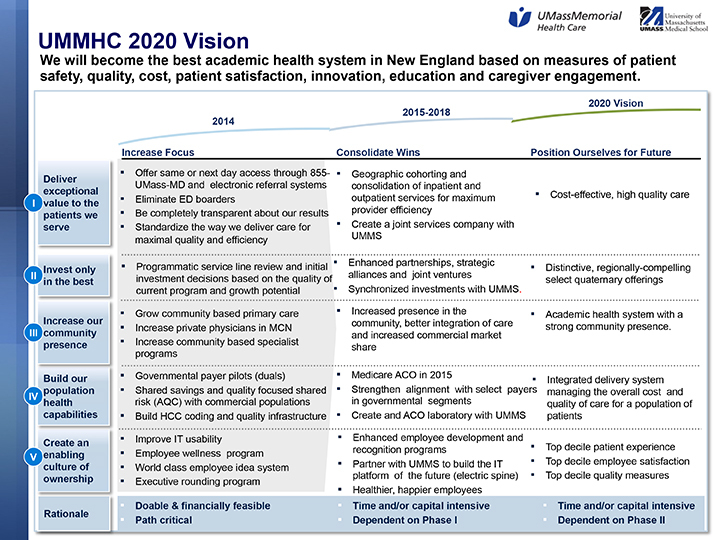 The first bullet point on this chart is about improving access: “Offer same or next day access through 855-UMass-MD (855-862-7763) and electronic referral systems (http://www.umassmemorialhealthcare.org/umass-memorial-medical-center/patients-visitors/patient-resources/make-appointment). This is one of the most important elements of our strategic plan, as it not only improves the patient experience, but also brings new revenue to the health care system and reduces the need for painful expense reductions. About 70% of our specialists are now offering same or next day access, which is great; unfortunately, there are other services where we currently have long wait times for patients to get in to see providers. Long wait times lead to unhappy patients who may look to find providers elsewhere, and we cannot afford to be turning patients away. Our goal is for same or next day access to all our providers, and if we can’t deliver on that goal, we will continue to struggle as an organization. As I recently stated at a UMass Medical School executive council meeting, nobody cares if you’re delivering cutting-edge innovative care if they can’t pick up the phone or go online and get an appointment with you. One area that has struggled with access is our Dermatology Clinic. They have a limited number of doctors that are in high demand. The dermatology team is also greatly challenged by geography. Right now they have to provide services on three different floors because we haven’t been able to find them enough space in one location. 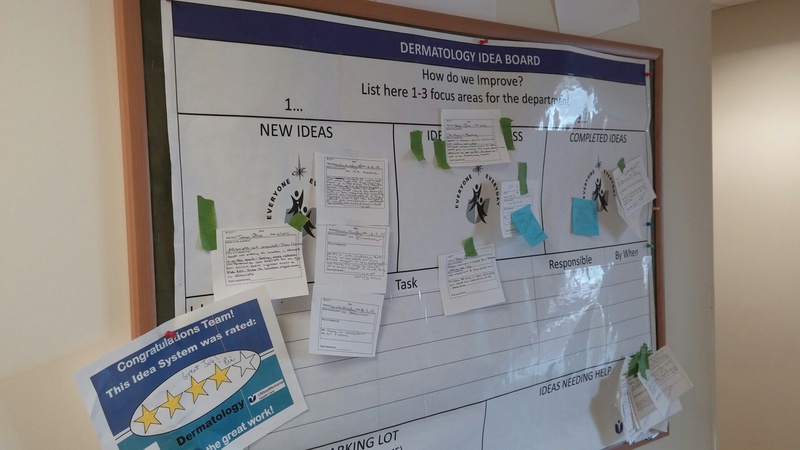 We’re working on this problem, but in the meantime, they have instituted an idea board and regular huddles to try and engage everyone in improving their processes and enhancing patient and staff satisfaction. One of their ideas was to open up the clinic for evening hours This is the kind of suggestion that will eventually help guide us toward reaching our goal of same or next day access for all of the services we provide. Although the dermatology access is still a problem, they are committed to using every one of the caregivers in the clinic to fix the problem, which gives me great confidence that they will succeed. If someone you know is doing a great job at improving access for our patients, please send me a note so I can visit their area. Today is July 12th 2014 — the last post was April 17th 2014… I have to say from my perspective and appointment schedules there really very accommodating. I have been seen by the Spine Clinic each time within 48 – 72 hrs. (one time time they called me back, DID tell me to go to the emergency room and I was transported to UMASS for Emergency Surgery early the next morning. As I read your blog, Dr. Dickson, my reponse was an unbelievable “wow” because I have had numerous appointments with specialist in Neurology, Physiatry, and Orthopedics and waited months to get an appointment. Two months was the minimum and more recently three months for a wait. These were first available appointments. How does one get a more timely appointment? Given the 70% statistic I would think even if I ws unlucky I might get one appointment in a more timely manner. Thank you for your note and I appologize that you had difficulty getting appointments with us. 70% of our specialists have committed to same or next day access, unfortunately, despite that committment, some are not there yet. That is why I am focusing so much attention on this. Did you have trouble getting appointments with orthopedics? I really would like to learn from your experience. I had a dermatology appointment with a private doctor in Milford today because 1) I could not get an appointment with the UMass dermatology clinic within 2-3 months, and 2) because I didn’t feel valued any longer as a consumer of healthcare with the UMass Dermatology clinic. And this is coming from an employee – I can’t even imagine what it must feel like as a member of the community to have to experience this. I’m sorry you had a problem getting appointment, I understand there is a real problem with dermatology access and will continue to work on it. If you send me specific information including name, date of birth and health insurance I have someone check into the co-pay issue. If you have your health insurance with us that doesn’t sound correct. My most recent experience here is minor in the grand scheme of things but I thought it might be of interest. I am a consultant currently working on the ICD10 project at UMASS. I fell on the ice a month or so back and cut both knees. A week after the fall it was obvious that my left knee had becaome infected. I called the UMASS urgent care center and was refused service. Instead I was directed to the ER even after I objected that this was not an appropriate level of care; the injury occurred a week before. The costs to me and to the hospital would have been higher than necessary. I went elsewhere for treatment which required x-rays, a dopplar study to ensure I didn’t have a clot in my leg and daily IV antibiotic therapy for 7 days to take care of the infection. This was revenue lost by UMASS that could have been avoided if the clinical staff had been better educated as to the costs related to the appropriate level of care. Please understand that this is not intended as a complaint. I hope that my encounter might help the hospital in a small way with its current financial problems. We are working to build an urgent care capacity as there are currently lots of patients like you who are inappropriately triaged to our emergency departments. Hopefully we’ll get this fixed soon.